When it comes to selecting the best free website builder software, you may come across several options.They differ in complexity levels, degree of web design expertise required to complete the project, implications, cost and other important aspects. Contemporary website builders are not the same they have used to be even several years ago. They offer a variety of advanced web building tools, features and innovative approaches. You may choose between versatile software that can be used to launch different types of websites as well as specialized niche systems meant for the development of a certain website type, be it a business website, a wedding project or an online store. Website builders are not only easy-to-use for everyone, but they are also convenient, intuitive and affordable. Is there anything else you might need to get started with your new project? 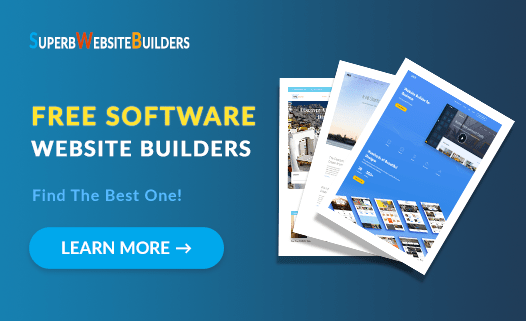 To help you with the choice of the best website builder software, we have decided to review the most popular and full-featured free services you can use to solve the required web building tasks. As mentioned above, the choice of website builders is so impressive that it’s easy to get lost in the niche, especially if this is the first time you decide to give it a try. So, what are those must-have factors you need to consider, when making the selection? A trustworthy website builder should be easy-to-use for everyone, be it a beginner with zero web design expertise and skills or a proficient web developer with years of niche experience. It should also provide a decent selection of ready-made (preferably, responsive or mobile-ready) templates and a set of tools needed to customize them. A website builder should ensure intuitive web building process. It should also be SEO-friendly and affordable for everyone to let users get the most out of its application. There are many all-in-one and specialized free website builders available out there, but it’s still important to make a profound search to select the best service to come up to your needs. The right choice will eventually save your time and effort, optimizing your web development process. Let’s review the most decent services now. Rich Template Collection. The website builder currently offers 550+ mobile-optimized free templates, which are intentionally subdivided into categories based on the themes they belong to. App Market. Wix provides a stunning choice of widgets, apps and extensions you can choose and integrate into your website. These aps are flexible and versatile, which allows using them for a variety of marketing, design, promotion, social networking, eCommerce and other purposes. It’s up to you to choose between free and paid options. Wix ADI. The website builder offers an advanced Artificial Design Intelligence tool that notably simplifies the process of website creation by automatically creating a project for you based on the information you submit. If you feel, however, that you are ready to launch a unique website on your own, you can make use of Standard Wix Editor to do that. Mobile editor is available here as well. Blogging and eCommerce. Wix makes it possible to launch free blogs and small-to-mid online stores. Its blogging and eCommerce engines are powerful enough to do that with ease. Multilingual Support. The platform offers multilingual support, which allows creating different language versions of your website for free. Wix covers the broad spectrum of web design needs, irrespective of the expertise level you have. Even though, the website builder has a free plan that never expires, it still makes sense to upgrade to the paid subscription to get the most out of the system features. The minimum paid plan will cost you $4.50/mo, while the rest of the plans are also quite affordable for everyone. uKit – is one of the easiest DIY website builders, which is mostly oriented on the development of small business websites. If you have ever worked with the system, however, and wish to use it to launch other types of websites, you are welcome to do that with no hesitations at all – so feature-rich and flexible the system is. The web building process is simple and intuitive here and it does not take much effort or time. Business-Specific Widgets. Being initially a small business website builder, uKit comes with a rich collection of niche widgets. These include LiveChat, MailChimp, Online Calculator, Stages, Timeline, Social Networks, Comments etc. Actually, you can successfully integrate any of them into any type of project you work on. Responsive Templates. uKit free template collection, which is regularly updated, is also worth the attention. The website builder boasts over 400 high quality responsive themes, which fall into niche categories to simplify the choice. SSL Security. If you wish to protect your website information from unauthorized access of scammers, free connection of the SSL Certificate will help you reach the goal. This especially matters a lot for business websites that frequently deal with online payments. Temporary Website Management Rights. The platform grants temporary website access to those team members or clients, who are involved in its management and web design control process. The system will automatically create the backup version of the project so that you could be able to restore it, if needed. SEO Optimization. The integrated Promotion widget provides SEO parameters of your websites and helps identify the factors that require improvement. You can also set up Google Analytics, if you have such a need. uKit feature set makes it possible for experienced and proficient users to launch quality websites almost for free. The cheapest uKit Premium plan will cost you $4/mo only, which is definitely worth the investment. Mobirise (current version 4.8.6) – is a completely free downloadable software, which does not rely on the Internet connection at all. To use the broad spectrum of Mobirise features, you should initially install it on your desktop. Block-Based Structure. The website builder allows building websites out of content blocks, the number of which exceeds 800 pieces and keeps growing on a regular basis. You can select and arrange them as you need to form the desired website structure. This is very convenient and allows controlling the web design process. Mobirise websites are responsive by default. AMP Website Builder. The software makes it possible to create websites, which are ideally optimized for the unsurpassed mobile browsing experience and provide quick loading of website pages. “Out-Of-the-Box” Design Customization Tools. The service provides extensive “out-of-the-box” feature set, which encompasses design editing tools, adjustment of style and font settings, media integration options and more. Free GitHub Pages Hosting. Websites created with Mobirise can be freely hosted with GitHub Pages, which adds to their performance. Mobirise is absolutely free for everyone, but mind that you’ll need to pay for hosting and domain name to make your website accessible on the web. As to the system itself, you can use it for the unlimited time interval and with no serious restrictions. You can also purchase the all-in-one kit at moderate cost, which includes all the extensions in one package. Having bought them once, you will be able to use these extensions for as long as you need to create appealing and functional websites for commercial and non-commercial use. WordPress (current version 4.9.8) – is a free Content Management System, which is rightfully considered the most popular software of this type in the world. The system was initially built as a blogging platform, but it’s now in demand with users, who intend to develop different types of websites with it. 100% Website Customization. It’s up to you to select and adjust the major settings to create unique website design. The system allows setting up fonts, colors, images that are available in stock or can be uploaded as you wish. You can also add your own documents, social media files, create galleries to impress your audience. Multiple Plugins and Third-Party Integrations. To boost your website performance, you can integrate plugins, templates or extensions that are developed by other designers as well as those that are provided by the system by default. When choosing between third-party integrations, make sure to check their safety and credibility of web developers. Powerful Blogging Engine. WordPress is initially known as a blogging platform and, thus, its integrated blogging engine is on the top notch level. The system makes it possible to create and manage blogs as well as to update them on the go. You don’t have to pay money for using WordPress – the CMS is free for everyone. However, to make your website accessible on the web and to promote it effectively, you’ll have to pay for the hosting, the cost of which depends upon the provider and the plan you will go for. AIDA. This is the Artificial Intelligence Design Assistant that has given popularity and recognition to the website builder. AIDA will design a website for you by using the information and content you will submit. 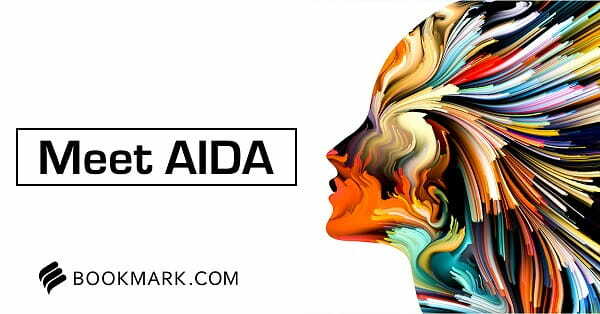 Websites created with AIDA look professional and impressive. Module-Based Structure. Bookmark is a module-based system. The modules it uses are similar to standard widgets offered by other website builders. You can choose between standard and eCommerce modules based on the type of website you plan to launch. eCommerce Feature. Bookmark boasts a powerful eCommerce module, by using which you can launch, run and manage even large online stores with multiple products available for sale. Advanced Statistics Collection System. Bookmark lets you find out current website statistics, analyze the factors that affect it and adjust the required settings, if needed. Bookmark is a free website builder, you can create a website at no cost and use it as long as you need. Premium subscriptions offer an extensive range of features and design customization tools. The minimum subscription cost constitutes $11.99/mo and encompasses features needed to launch decent websites. Launching a website doesn’t have to be a complicated process, even though, it may initially look like this. The use of website builder software will notably simplify the task for newbies and professionals. These systems are easy to use, convenient, intuitive, feature-laden and flexible. They come with ready-made templates abundance of customization tools to give them required look. Website builders are also much more affordable as compared to other web building options. Wix is a great choice for creating different types of websites for free. This is a universal website builder software, which is simple yet powerful. 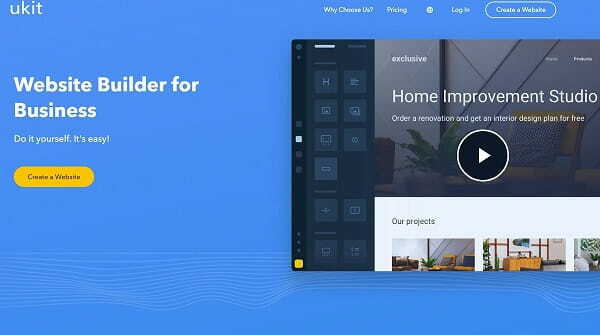 It is currently the best free website builder, which comes with impressive features like mobile-optimized templates, multilingual support and Wix Code. uKit is a perfect solution to launch a business website. It is one of the easiest services you can find on the web nowadays. The website builder features the best price/quality correlation, being one of the most affordable platforms, offering such an amazing set of features. Mobirise is the downloadable software, which is a nice choice to launch landing pages, portfolios and business websites. This is an absolutely free downloadable software, which requires installation and offers an extensive selection of web design features and options. 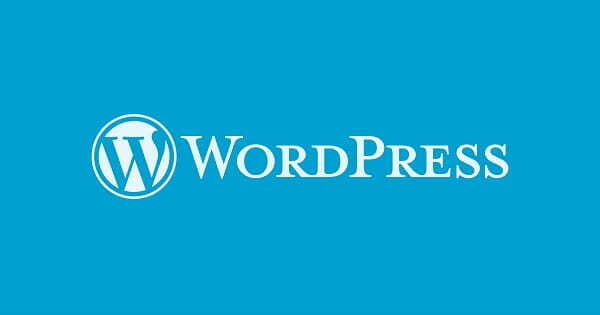 WordPress is currently one of the most famous CMS in the world. The program initially known as a blogging platform, but users often choose the system to create different types of projects with it. WordPress is absolutely free for all user categories. Bookmark has distinguished itself as a decent AI-powered website builder. The system offers an advanced AIDA assistant, who creates the website structure and design for you by using the info provided. This is stunningly simple and impressive. Each of the programs reviewed in the post features quality, functionality and deserves the attention of users, who intend to create appealing websites on their own. These are the best free website builder software, which can come up to various needs and web design aspirations. If you are unsure about the website builder that will work best for you, take your time to test and explore each of them to make the right choice.